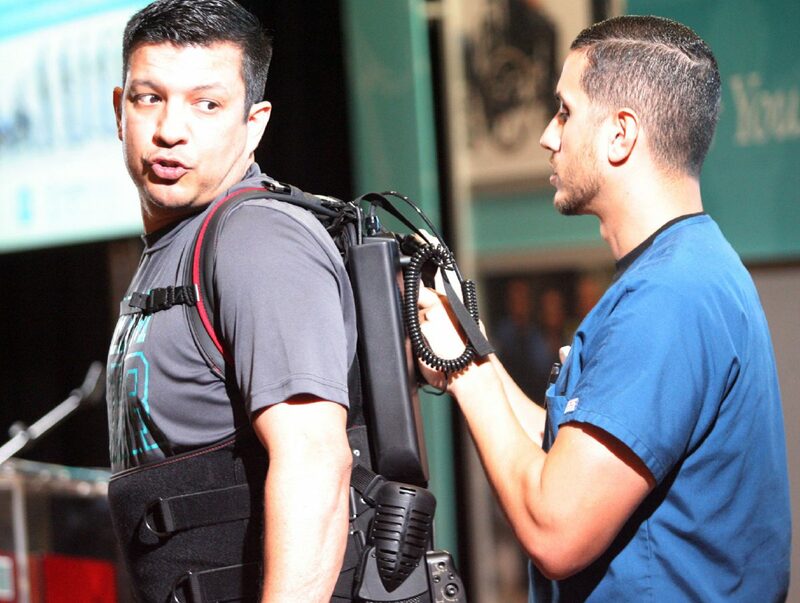 Sam Lopez, a Physical therapist with Doctors Hospital at Renaissance, helps Donald Barajas while he wears the Exoskeleton robotic assisted device during a demonstration and press conference at Edinburg Conference Center on Wednesday, Sept. 27, 2017, in Edinburg. EDINBURG — Face down on the floor. This is how Manuel Garcia’s wife found him one January day in 2014, when he had suffered a stroke that left him unable to move his legs. The Nikki Rowe High School teacher, who had suffered from severe migraines before a vein ruptured in his head, then faced years of grueling physical therapy to do what doctors said he would never do again — walk. But on Wednesday, three years after the ordeal, Garcia did just that. Donald Barajas listens as his therapist Sam Lopez adjusts the Exoskeleton Bionic device Wednesday Sept. 27, 2017 in Edinburg. Sam Lopez, a physical therapist with DHR, helps Donald Barajas while he wears the Exoskeleton robotic assisted device during a demonstration and press conference at Edinburg Conference Center Wednesday, Sept. 27, 2017 in Edinburg. 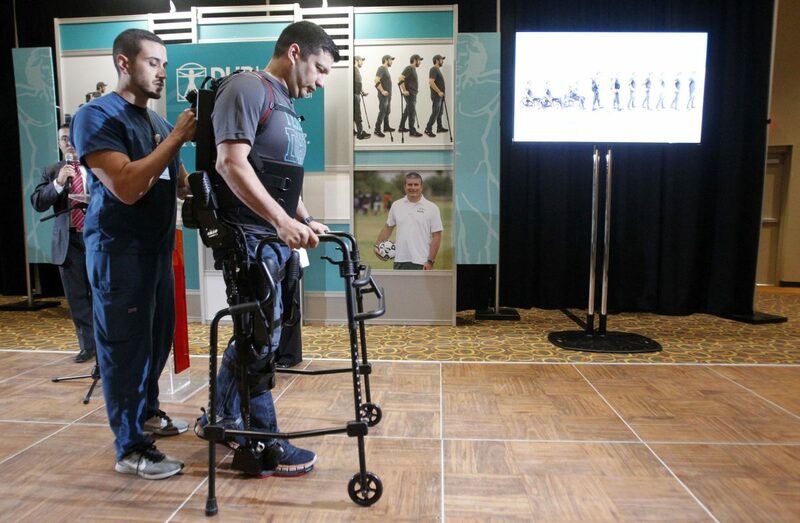 Ekso Bionics uses the power of ingeniously designed machines to empower people and help stroke patients and rehabilitation in therapeutic sessions Wednesday Sept.27,2017 in Edinburg . 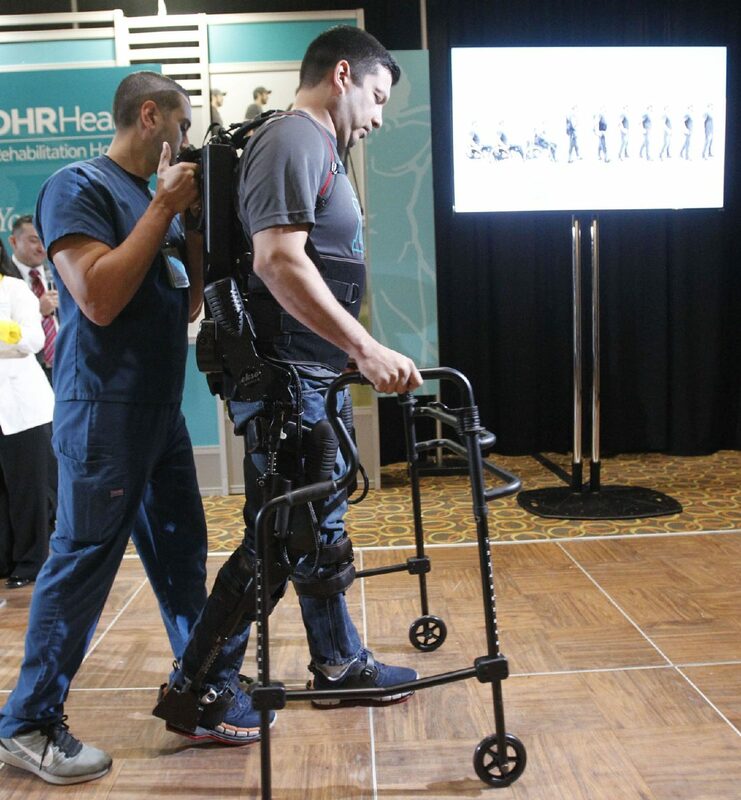 DHR Health Rehabilitation Hospital announced that it is the first facility south of San Antonio and Houston to implement the device, which was manufactured by California-based Ekso Bionics. It helps individuals like Garcia regain the ability to walk. Using non-invasive sensors within the crutches to send signals to a computer worn on the back, the exoskeleton looks not unlike a backpack with leg braces. Among many settings, Dr. Michael Auer, director of rehabilitation therapy services, explained a feature that allows a therapist to control its steps by the press of a button. Another setting, the pro-step, allows the patient to do as much as they can. Whatever they cannot do, Ekso will do the rest. A chirp lets the patient know when their body weight has properly shifted to one leg, allowing them to advance the other. He explained that patients with a pathological gait might move a leg too soon or too late in the gait cycle. The Ekso will not let the patient take a step until the chirp is met with the proper weight shift. The device itself also estimates the percentage of work a patient and the Ekso are performing. That information is stored for research purposes. The machine, however, is considered a mere tool that only works as well as the therapist that wields it, Auer said, adding that their therapists underwent a two-week certification in order to operate it. Another patient, Donald Barajas, used the Ekso device to help in his recovery from a car accident that also left him unable to walk. Since being fully certified in May, DHR has had 25 to 30 patients use the device with four patients using it now, according to Auer. To be eligible, patients must be between 5 feet 2 inches and 6 feet 4 inches tall, as well as weighing no more than 220 pounds without active deep vein thrombosis, Stable blood pressure is also a must, as is not being pregnant. Auer said they also try to stay away from patients with osteoporosis. 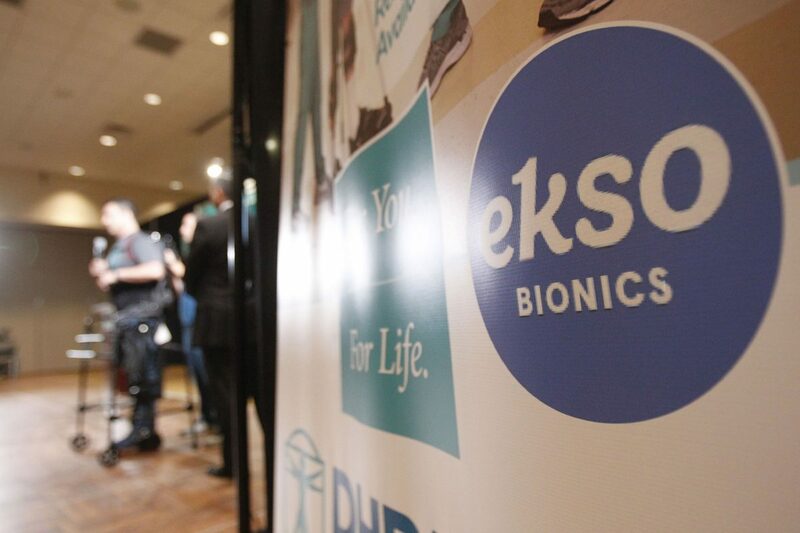 For the patients that do meet the criteria, they have two Ekso devices available to accommodate in-patient rehab and their outpatient division. Garcia began using the device during his outpatient treatment, where they set specific goals for him. His ultimate goal is to run a marathon. Until then, Garcia hopes to return to work as a coach at Nikki Rowe. The school district first wanted to ensure sure that he could walk on and off the field and perform CPR if necessary, according to Auer. “We used our CPR mannequins at DHR and we were able to display that,” Auer said. Although he noted some deviations that need to be “ironed out,” Garcia and Barajas have improved significantly and continue to meet their goals. For instance, Barajas already drives on his own while Garcia is expected to begin driving Monday.